I have a Jandy RS-8, Model 8156 on f/w L.
BTW, is there a link somewhere to a cost analysis for doing solar? We run NG in the spring and fall to extend the swim season but does that ever spike the gas bill and if it is cheaper to run solar (free, less installation costs and occasional maintenance, it would seem) I'm definitely interested in it. Thanks! I'll check it out when I'm not mobile. Is there a build thread or guide on this site? I searched but didnt find one so either my search terms weren't correct or there isn't one. I did find a lot of build threads though, just not one with the I got this and don't get this along with here's how I set it up type of information. I will start with the "I'm not an expert" disclaimer In order for the controller to work, the solar installers added a temperature sensor up by the panels, plugged the JVA into the board and set the max temperature. When solar is enabled in the controller menu, and the solar panel sensor reads a higher temperature than the water temperature, the valve is opened providing solar heat. We had existing sensors for air and water temp as well as a newer system so I'm sure YMMV. As as far as a cost analysis of solar, there are many variables. Ultimately it comes down to btu management/cost so determining your requirements is a good starting place. What is your heater size x run time? Have a solar company out and see what their recommendations are in respect to size, orientation and cost. As an added benefit, they may know if they can integrate into your existing system but will more than likely push a stand alone controller. Don't believe all the salesperson hype. Once you you know the size and orientation, you can project btu output. If you have a 400k btu per hour NG heater, you will probably be disappointed by only getting 400-600k btu per day from a decent sized solar system. Do you cover your pool? Without covering early and late in the season btu losses will probably outpace what a solar would produce. Jandy rs-8 solar operation is built in and easy to utilize. You need panels, temp sensor (for the roof), 3-way valve (with small hole to allow panel drain back) and a jva controller. As stated above, The contoller reads roof temp and desired pool temp then determines whether to turn on the solar or off. When the rs-8 is set up to assign the jva to solar operation, you will have an option on the screen to enable solar. You dont have to set the pool to max temp, just what your desired set point otherwise the pool can get too warm. I set mine at 85 degrees year round. Dont let an installer talk you into buying a separate controller- you dont need one! It's also much cleaner to have one system to controll all pool functions. as far as cost, its literally free compared to LPG or Propane (virtually zero cost when normally filtering water- and just electricity costs if you are extending pump run time to collect more heat). I ran 10 4' x 12' panels on our 18,000 pool and it is swimmable from march through october. You can also supplement with a solar blanket and increase heat production ~50%. We've had a cold and wet winter in norcal but the pool is still 73 compared to outside temps in high 60's. Thats only running 4 hours a day. A standard 4 x 12 panel puts out about 1000btu/sqft per day. 8 panels would generate ~ 3MM btus a day. Running a 400k btu gas heater for 7 1/2 hrs a day provides a comparable output. there are many DIY kits and videos on installation, sizing, etc. Also with electrical solar becoming so popular, many used panels are showing up on craigslist when removed to utilize the space for electrical solar. After 10 years on my DIY system, I just bought 6 used panels on craigslist for $300 to replace the old ones which had started leaking. You can buy a system for less than 1/2 of the price normally quoted by installers. I finished my installation in a weekend fwiw. Running a 400k btu heater for 7.5 hours would provide ~3 million btu while eight 50,000 btu/day (not per hour) panels would only give you 400,000 btu/day assuming a nice sunny day. True, running solar is about the long game. Run it daily for slow incremental gains at first as things heat up. I typically gain 5 to 7 degrees on sunny days and lose 1-3 degrees overnight with a solar cover. So, gaining 3 or 4 degrees per day gets you there after a week or two. This would definitely by DIY. I figured as much so once I actually assign the JVA to the Solar switch it will be active in the settings portion of the panel. I saw that on the manual on Jandy's website but it was for a much newer f/w version so I wasn't sure. I bet they didn't bother changing much there over the years. Due to the cooler spring this year over last, I suspect, our gas bill is $130 more to heat the pool for use on those warm Saturdays we've been having lately than it was to do so last year. Nothing else has really changed since last year as our home is relatively new and keeps the heat in pretty well and the heater has been off for the most part but there may be some for the "decorative gas fireplace heating appliance" that is more than last year. Let's say it is $100 more for 3 to 4 months a year so put it at $300 to be conservative. You got panels for $300 used plus piping, a three way valve and a Jandy Valve so let's put it at $600 ~ $800 plus the weekend of time. Seems that this would cover itself in a two to three years from what I see here. Our back yard faces about 160 degrees SSE and gets pretty good exposure except where I'm looking to put these panels starts to pick up shade about 3pm in the spring and fall. I am figuring to put a cover over the pool equipment pad / enclosure that is already there so there' that additional labor and material but I already plan to do that. No need to put tile roof even. I'm thinking some sort of water proofed framing just to support the panels as there is no living space below. This area is hard to see in the areal photograph attached but it is about 15' x 12' and indicated in the orange rectangle I drew. BTW, the vegetation that is shading the pool in this picture has been removed but some will be added, just not as high or as thick. Also note that this picture looks to be taken about 11 am in either the early spring or late fall from the length of the shadows. I think you can see where the afternoon shading would originate. The top of the picture is due north. So therein lies the kicker. 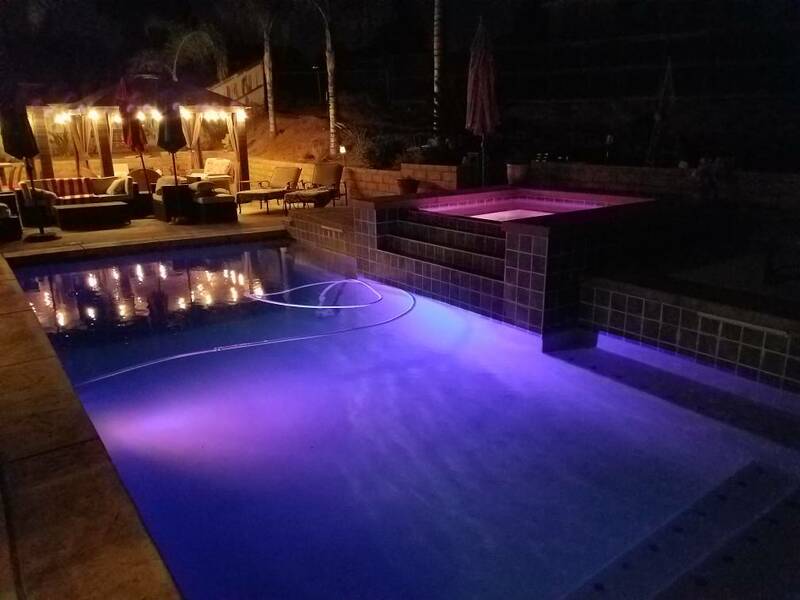 We like the looks of our pool at night with the lights and now the slow trickling water cascading off the spa into the pool so we'll be losing some heat for sure. How much? IDK but if I can get solar gains, preheat so to speak, I'll save a little on the gas bill. I guess I was being optimistic on the returns I put in my post above. Payback sounds to be much longer as maybe the savings are more like $100 a year, rather than $300 a year I assumed below. That said, to have the pool swimmable on the weekends the last month or so that heater has been on long and steady so maybe it would be better than $100 a year in savings. That's where a decent calculator/estimator comes in. I'm checking that out now. Pretty good information in there. I wonder if CA has something similar? I will be looking because FL is a much lower latitude than we are which does make a difference. Apparently there's more information at SoCal GasCo but there site has been down for a couple of days right now. This Google picture is a bit older but it is clearer on the area of concern. I'm thinking it might be a good idea to get a solar cover first to conserve the heat I'm dumping into the pool in the form of NG burned and dollars turned to ashes and polluting the atmosphere. I started looking around and they run between $100 to $150 and up to cover my pool depending on the thickness. Because we have very limited vegetation in the pool area the stuff getting into the pool is quite low, except the cottonwood "cotton" that covers the surface every spring and due to the amount of rain this year is more than usual, using a cover for debris prevention is really a non-issue. Even if it were an issue it is subjective at best as to the value. My question is this. Will dishing out this amount of cash on a cover really return any benefits as to payback? I figure that in the spring and fall we end up spending between $300 to $400 spread out over to heat the pool for what is between 3 and 4 months on weekends only for the most part. I'll bring it up to 87 and for the most part, depending on conditions, it is down in the mid 60's to low 70's by mid week. Yes, the solar cover will make a big difference in overnight heat retention. There is a little data toward the end of my pool thread, link in sig. Get the 8mil cheapest one you can find. Seems like mine, 20x40, was a couple of hundred bucks. I think I got it at Sunplay or maybe Inyo. Our pool temps easily stayed 5-8 degrees warmer with the cover on. From your comment in another thread I know that you like to heat the pool for weekend pool fun but I also know you have solar. That said, do you have to add heat with your pool heater on a typical weekend in the spring and/or fall? If not, or not much, that is pretty awesome. I'm just trying to justify the cost of going solar by monetary payback because it is quite an outlay and if the payback is long it may not be worth it. Using a solar cover is a cheap start though, we just lose the beauty of our pool in the evenings and early mornings. It is just outside our back patio door and looks like we're at a resort in Cancun and the cover will change that! I like this but if it is costing me too much money I can do without..
Yep, solar covers are not pretty. And for us tree debris makes it more painful. But, swimming in March and October have made it worth it. Our solar array is smallish because we ran out of room on the roof it is installed on. 240sf solar vs 700sf pool. 50%-100% of pool surface is the usual recommendation. We do have to use the heat pump to add heat most weekends in march/April and october. Usually, it is less than 5 degrees and never more than 10. When I turned the heat pump on yesterday for this weekend the pool was 80°, even after a bunch of rain Sunday and Monday. And if it hadn't been cloudy the last few days and today I probably wouldn't need the heat pump at all. Hi temps have been 70-71 and low temps have 59-60 the last few days. So, the solar cover alone has kept the pool temp at 80. It was 84 yesterday afternoon and I haven't checked yet this morning. Our pool is also in partial shade most of the day. It gets full sun for less than 2 hours mid-day, otherwise some parts are always shaded. So I looked around on CL for used solar panels. Looks like they're going for about $40 to $50 each for 4'x10 or 4'x12 panels. I see both Heliocol and Fafco thus far. One guy has a whole system for $400 which is a combination of 4'x12' and 4'x8' panels totaling 304 SF with fittings and connector hoses. As I'm just starting my search I'm wondering if this pricing seems reasonable, considering that may be different in different markets and also wondering if I need the fittings when I get the panels or if they are relatively easy to obtain otherwise. I'm also curious as to why there'd be a used market for these things (Maybe being replaced with PV Solar Generation?). Yes, there seems to be more pool solar panels available in the southwest than anywhere else, presumably being replaced with PV panels. What do you think about pricing and brand quality? Apparently the Heliocols are 13 years old beyond warranty age and are being sold by some guy saying he deals in used solar hot water panels. What the...? The other whole setup is quite some distance from me but are Fasco and only 8 years old. Some of the others are not indicated as to brand but the majority are Fasco from what I'm seeing right now. BTW, my first aerial above shows all the PV we have already and the proposed area. The clearer picture in the next post shows better the area for putting a roof over my equipment enclosure as well as some of the afternoon shading in that area. This is way we didn't invest in PV panels in that location anyhow. The lower patio cover roof is not acceptable for aesthetic reasons.